read the newspaper while others snapped. Ticked off! Done it! Then we rushed back to change and meet our guide for the 8 days, Ibrahim, who was looking at his watch. We always seemed to be the first lot to be picked up by the coach. There weren’t many people in our hotel and I couldn’t quite make out whether it was a bad season or the end of a season. It was pleasantly warm with light clouds, very recognisable spring weather. 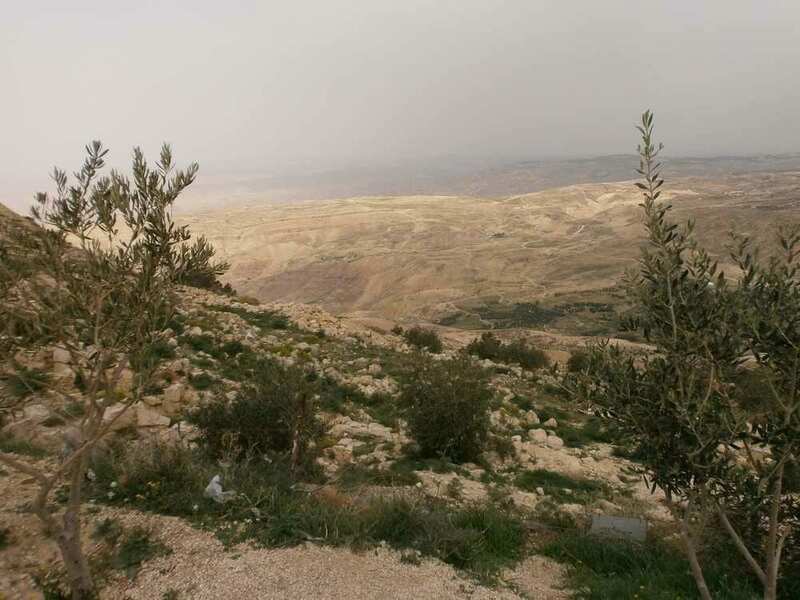 Mount Nebo has been a place of pilgrimage for centuries. Churches had come and fallen into disrepair, but the early Christian mosaics remained, now excavated. The large tesserae present bold pictures of leaves, animals, birds, priests and worshippers with brown-circled eyes as if marked out with bitumen, or tar, from the Dead Sea. A new church is almost finished, using the old foundations. We looked down over the dry and rocky land towards the River Jordan and a strip of welcome green. Beyond it was the Promised Land that Moses never saw. His tomb has not been found. We sampled delicious introductory dishes, rather tough roasted lamb and sweet semolina pudding topped with spices in Madaba before leaving for St. George’s Church with a unique mosaic map of the Holy Land. Then began a long journey through the Biblical land of Moab, south of that of the Ammonites, into the land of Edom – all Semitic peoples like the Israelites. For some of it we went along the Dead Sea highway. Tar or bitumen was taken from the sea and used on ship’s hulls. 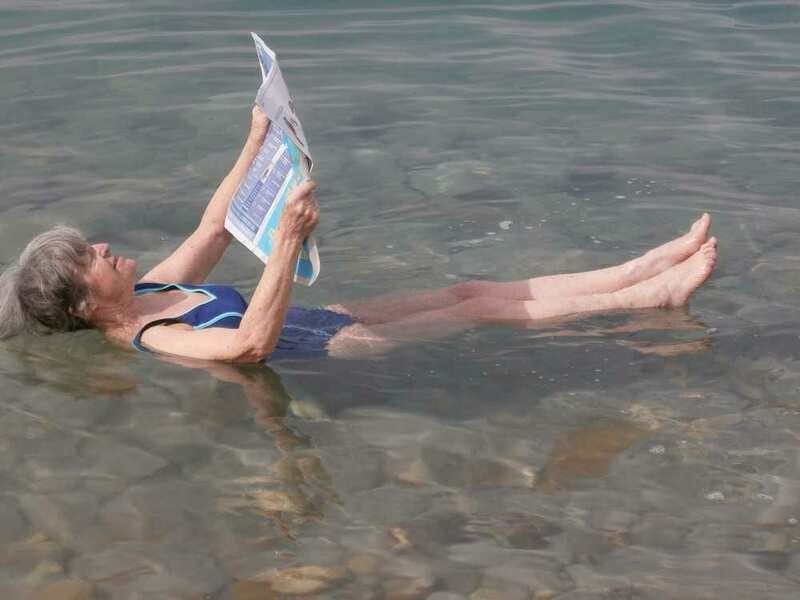 The water level has fallen by more than 20 metres in the last two decades because of the intensive farming on both sides of the River Jordan which feeds the Dead Sea. Water, never enough here, and tourism doesn’t help. The mountains were treeless and much of the lowland stony and uncultivated, grazed by a few scrawny goats and sheep. We nodded off on the way to another resort hotel on the Red Sea at Aqaba. Bliss, the next morning is free, with an optional excursion to T E Lawrence country in the afternoon. A sleep-in to look forward to.